As you know, Red Line Art Works is a global arts project whose aim is to encourage artists to create work about the big global concerns. Bad Leaders and Bad Governance are among the biggest problems because so many other big Global Concerns arise from them. The USA is the world's most economically and militarily powerful nation on earth, so now that there is a crook at the head of the country we believe it is imperative for everyone, including those in the arts, to face up squarely to this truth. To evade or deny this truth (or simply to 'forget' about it) is to be complicit with Trump and other bad leaders. Trump should not be above the law. He should be made accountable for his words and deeds. The good news is that this process has begun, albeit very slowly in the USA, and we will follow it below, as it develops. Our Profile of Trump is here and our account of his end times starts below. Trump's end times could be the most drawn out and drama-filled political downfall you will see in your lifetime, so don't miss it ! "and any matters that arose or may arise directly from the investigation". Mueller has an experienced and expert team and his investigation has taken over several FBI investigations relating to Trump. Many other matters have also quickly "arisen" so the scope of the investigation has been broadening - way beyond its starting point, but nobody knows exactly how much because most of the investigations are still secret, as they would be in any criminal investigation. 2. Up until mid-September 2018, it is public knowledge that at least 87 contacts have been proven to have taken place between Trump's team and Russian nationals. Every one of these contacts has, at least initially, been denied by Trump or his various spokespeople, but the evidence is solid. You can expect more evidence on this from Mueller as time passes. Mueller's investigation is also assembling evidence of Trump's and his cronies' multiple criminal acts and illegalities - well beyond the 'Russian interference' issue. So far (up to August 2018) over 100 criminal charges have been made against 32 individuals and 3 companies as a consequence of Mueller's investigation. Six of the accused have so far been found or pled Guilty to crimes. Others have been found to have violated federal ethics rules, or forced to resign over security clearance issues. These are only the first Convictions (more on some of these below) and we already know that more Trials are coming. 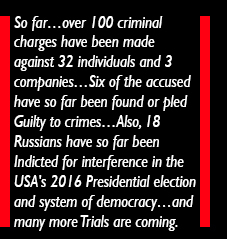 Also, 25 Russians have so far been Indicted for offences of interference in the USA's 2016 Presidential election and system of democracy - although it is unlikely they will ever face charges in a U.S. Court . not get rid of Mueller. The Deputy Attorney General Rod Rosenstein has oversight of Mueller's investigation and has given Mueller permission to widen the investigation to cover matters 'arising' from the testimonies of 'Flipped' ex-Trump cronies, such as Flynn, Cohen, Manafort, Weisselberg, and information from others. There is more below on some of these key people in Trumpland (see paragraphs 4-13) because they are now likely to play a significant part in his downfall, as we explain below. 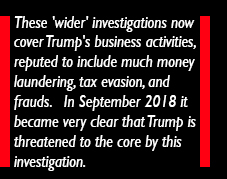 These 'wider' investigations now cover Trump's business activities, reputed to include much money laundering, tax evasion, and frauds. In September 2018 it became very clear that Trump is threatened to the core by this investigation. Trump has also previously tried to obstruct justice by his attempt in July 2017 to rewrite his son Don Jr's false account of the Trump Tower meeting with a Russian national who was promising 'dirt' on Trump's Presidential campaign opponent Hillary Clinton. Mueller is also investigating whether Trump or anyone else has conspired with others to break various electoral, financial and other laws in his election campaign. As this criminal investigation widens (see more below) the walls are closing in on Trump. 4. In April 2018 the home and offices of Trump's long-time personal Lawyer (and general 'Fixer') Michael Cohen were raided by the FBI. Many items and documents were seized and Cohen was under criminal investigation. This placed the sitting President of the USA just a heartbeat, or less, away from any crimes committed by Cohen and others. Interestingly, the Prosecutor said that, as far as they could tell, Cohen appeared to only have one client - Trump. This placed Trump, his family and other associates in the spotlight and under extreme pressure. 5. Events since the FBI raid on Cohen have been regularly ramping up the pressure on Trump and his associates in the White House and elsewhere. On 21 August 2018 (a very bad day for Trump, see more below) Cohen, in a criminal Trial, was found Guilty of various crimes including tax evasion, bank fraud and the violation of campaign finance laws after paying hush-money (just before the election) to two women who, it is alleged, had affairs with Trump. Cohen faces a possible jail sentence of several years. 2016 Presidential election. Trump then (in a TV interview) admitted the hush-money was paid from one of his many accounts. Since this is clearly illegal, Trump had (in his usual idiot style) admitted this further crime and is therefore currently an un-Indicted co-conspirator with the convicted criminal Cohen. Paying this hush-money is one of the ways in which Trump tried to hide these unsavoury facts from the public to influence the election and cheat his way to the Presidency. By the way, the last President of the USA to be an un-Indicted co-conspirator was the criminally corrupt Richard Nixon - and that ended badly for him too (see more on Nixon in paragraph 21 below). Incidentally, in the same TV interview Trump claimed : "I tell you what, if I ever got Impeached, I think the market would crash, I think everybody would be very poor...Because without this thinking [pointing to his head] you would see numbers that you wouldn't believe in reverse." Unsurprisingly, Dim Dumb Delusional Don seems to think the world would end if he was Impeached. Delusions abound ! We think this Idiot-in-Chief would be so upset that he would throw all his toys in the corner too ! jail. The jury in the Manafort Trial failed to reach a verdict on 10 more charges, so leaving open the certainty that Manafort would be re-Tried soon on these outstanding charges. Before, during and after this Trial Trump repeatedly claimed that Manafort was "a Good Man", "a Good Guy", a "very good person" and did not deserve to be tried or convicted ! This opinion is one of many which confirm that Trump's own moral and ethical standards are down at the level of the gutter - probably lower. However, the more positive news is that by mid-September 2018 the Mueller Investigation announced that Manafort (now in Jail on a sentence of at least ten years) had also 'Flipped' and had already started giving them information on subjects they are investigating. Only a few hours before Manafort went to Court to inform them he wanted to 'Flip' Trump was still praising him, still believing (wrongly) he had his loyalty. 10. On this same Very Bad Day for Trump (at the end of yet another Trial emerging from Mueller's investigations) his former National Security Adviser, Michael Flynn, was due to be sentenced, having been found Guilty, among other things, of lying to the FBI about the Trump campaign's meeting with Russians to discuss election matters. Flynn has admitted these criminal acts and been convicted of them in Court. He is awaiting a jail sentence but has also decided to 'Flip' and give Mueller information about any matters being investigated. So, Flynn's usefulness to Mueller's investigation is now ongoing and its anybody's guess what information he is giving to Mueller - and who that will implicate. Mueller therefore requested that the Court should defer Flynn's sentencing for the time being, and the Court did this. 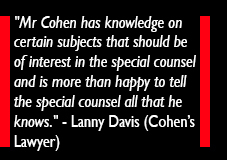 to Cohen's convictions) had now agreed to Flip and co-operate with Mueller and federal prosecutors. The WSJ described Weisselberg as "Trump's longtime financial gatekeeper" and reported that he has been an executive at the Trump Organization for over four decades, and "after Mr. Trump was elected, he handed control of his financial assets and business interests to his two adult sons and Mr. Weisselberg." So, Weisselberg is an absolutely central figure in Trump's business dealings over the past four decades. He is said to know “where all the financial bodies are buried” in Trump’s (over 500) businesses (in over two dozen countries) . Many of these are clearly 'shell' businesses with no employees or real premises, but all under the Trump organisation 'umbrella'. 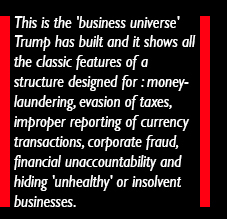 This is the 'business universe' Trump has built and it shows all the classic features of a structure designed for : money-laundering, evasion of taxes, improper reporting of currency transactions, corporate fraud, financial unaccountability and hiding 'unhealthy' or insolvent businesses. Trump cannot afford to have the dealings inside his business universe exposed to Mueller's criminal investigation or to the FBI, so Trump and his family members and associates are now looking extremely nervous about all this. 13. Legal analyst Harry Litman, a former U.S. attorney, told MSNBC there is now "a sense that the dam is breaking over the last week and people are rushing in from all sides." According to Litman : "Everybody who's around Trump now - and has been over the last ten years intimately - is in a world of hurt with legal battles on all sides." Around the end of this week The White House also announced that the White House Attorney (its top lawyer) Donald McGahn was now leaving the White House. It emerged that McGahn (who has not been accused of any crime) had voluntarily "co-operated extensively" with the Mueller investigation, reportedly spending 30 hours sharing detailed information with the investigators - without Trump knowing this. Clearly, when he discovered this the idiot-in-chief at Trumpland quickly told McGahn to never again 'darken his doorstep', so he left. he is a 'very stable genius". That is Trump's self-image. The evidence of all these Felons being found in the Trump team contradicts Trump's self-image and supports the view that Trump himself is a crook, pure and simple. This legal Tsunami is heading towards Trump because Trumpland is like a Festival of Felony ! So far 32 individuals and 3 companies have been charged as a result of the Mueller investigations but there are clearly more Indictments, more Trials and Convictions to come. These are only the start of the legal problems facing Trump and his cronies. It is now starting to turn into a Carnival of Convictions. 15. So, the walls are closing in around Trump and his family, his Foundation, his businesses, his (withheld) tax returns, and around more and more of his associates. Trump's regular protestations that the Mueller investigation (and the growing media coverage of its progress) is all a 'Witchunt' against him sound more panic-fuelled as the days pass. As the investigation moves inexorably closer to Trump and his family, each time public evidence confirms his ever-rising tide of lies he shows increasing anger, discomfort and paranoia. He is full of lies, distortions, evasions and diversionary talk - not the response of an innocent man. Was Trump Laundering Russian Money...And Did the Russians Help Trump Cheat His Way to the Presidency ? critical. It is likely to be mind-boggling. Between them they know just about everything regarding Trump's relationships with Russians, and much more. They will know about the hundreds of millions (or billions) of dollars of illegal funds which poured into Trump's businesses from Oligarchs from Russia and ex-Soviet states. Was this laundered through Trump's shell businesses and offshore tax havens ? Through such mechanisms many of these Russian 'businessmen' bought apartments in Trump properties in the USA in what appears to be a massive money-laundering scheme. The exposure of such vast criminality threatens Trump, his office, his money, his image, his companies, his properties, his family, his lavish lifestyle, everything he owns - and his freedom. 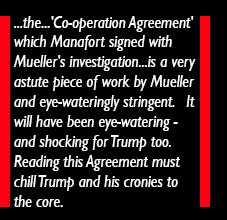 Reading the Manafort Agreement with Mueller (see paragraph 9 above) should have made this threat abundantly clear to Trump (although multiple reports from inside the White House are that Trump reads nothing !). 17. The Washington Post reported in September 2018 that Trump had set a new personal record (for himself, since becoming President) of making 125 false or misleading statements in 120 minutes ! According to the WP's fact-checkers Trump had made over 5,000 false or misleading statements while in office and had recently averaged 32 per day. Mixed into these statements is much anger, impatience, ignorance and paranoia. Trump now knows he is in deep trouble and this behaviour will probably continue until the end, possibly becoming more extreme. So, we can safely predict that there will be many more lies, angry denials, false or misleading statements, diversionary and disruptive tactics from Trump. He is a major danger to his own country - the alarm bells have been ringing for a long time now. the law and justice, above the Constitution and above any shred of Democracy left in the USA. This may look like the 'Madman in the Castle' syndrome but its much more than that because of all the enablers and supporters in his administration and the Republican Party. Trump's only concept of the Presidency has been that it should give him the powers of an absolute Fascist Despot and Dictator. He thinks that he alone should be free to decide everything and deny anything. He thinks that what is Truth and what is Fake is for him alone to decide. The depths and details of Trump's many delusions are being exposed more as time passes, as events overtake him and as the truth catches up with him and his cronies. Meanwhile, the Republican Party continues to protect him. THE NOVEMBER 2018 U.S MID-TERM ELECTION - WHAT HAS CHANGED ? to expand investigations, if they wish. In the immediate aftermath of this election Trump did what he had been threatening to do for a long time, he sacked Jeff Sessions, his own choice as the U.S. Attorney General. This was yet another serious 'Obstruction of Justice' by Trump. Sessions was no use to Trump because he had 'Recused' himself from overseeing the Mueller Investigation, while Trump had repeatedly asked Sessions to sack Mueller and stop the Investigation. On several occasions Trump explained 'on-the-record' that he had threatened to sack Sessions for this specific reason. Just to clarify that : The sitting President of the USA - the man who is the subject of an ongoing criminal investigation - asked his Attorney General to fire the man leading that investigation ! Sessions did not do this and his Deputy (Rod Rosenstein) has so far shown no signs of doing so, despite intense pressure from Trump and his cronies. 20. The day after the mid-term election Trump sacked Sessions and appointed an 'Acting' Attorney General to replace him. This is Matthew Whitaker, a keen Trump supporter and fierce critic of Mueller and his Investigation. It is not very surprising that Trump's appointment of Whitaker has, in the words of Nancy Pelosi (who leads the Democrats in the House of Representatives) placed the country very close to a full-blown "Constitutional Crisis". That is a definite understatement. She also said it is a "blatant attempt" to end, impede or undermine the Mueller Investigation. Even some senior Republicans are alarmed by Trump's action and have said that Mueller's Investigation should not be impeded in any way. Democratic Senator Chuck Schumer said : "Clearly, the president has something to hide." That may be the understatement of the year ! requires him to sack Mueller or cut down the investigation, sabotage it, strangle it, or kill it off - any way will suit Trump. In a previous interview Whitaker has mused about any new Attorney General seeking to crush the investigation : ..."he just reduces his [Mueller's] budget to so low that his investigation grinds to almost a halt." Trump has previously claimed that he could personally take over Mueller's investigation : “I can go in, and I could do whatever - I could run it if I want”. Yes, Dim Dumb Delusional Don really does believe that he could take over this Federal investigation into himself ! Presumably the first thing he would do is try to destroy the evidence and paperwork. However, Mueller's team has probably put a back-up copy (or several) somewhere safe - wouldn't you think ? Its basic good office practice, after all ! Maybe Trump will try to organise a burglary, just like Nixon did in 1972 ? Question : Just how delusional does a U.S. President have to be to get Impeached by his Republican Party ? members and his cronies will it target - and how serious will the crimes be ? This next phase of Indictments could happen anytime soon and it could be a big one ! Could this step by Mueller precipitate action by Congress to rein Trump in, possibly to Impeach him ? Will the Republicans in the Senate decide to 'Dump' Trump at this point, or will they continue protecting him ? 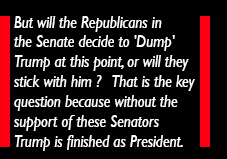 That is the key question because, when he loses the support of these few dozen Senators, Trump is finished as President. Its obvious that whatever anyone else does, Trump will just continue being Trump. He will go on bragging about himself, dividing the nation and doing as much as he can to avoid Justice by any means. Trump's permanent 'normality' includes being unhinged, narcissistic, egotistical, a pathological liar - and a menace to his country. Be assured, Trump will only ever help himself, not the country. 23. If the Democrats do protect the Mueller Investigation and Trump can't get it killed off, perhaps Trump will try to dismantle the leadership of the Department of Justice (it oversees Mueller's Investigation) ? In an interview with the New York Times he said : "I have an absolute right to do what I want to with the Justice Department". In the light of Trump's extreme, alarming, impetuous and vindictive personality, if he cannot get his own way will he escalate even more the divisions inside the USA into major conflicts ? Will he call a 'State of Emergency', try to suspend the constitution, or start a war somewhere, just to distract attention from his own problems ? Anything is possible because Trump feels no moral or ethical constraints. He is completely unmoored morally and ethically - as is the whole neoliberal hierarchy that shapes the U.S.A.'s toxic political-business system. There are plenty more of these morally and ethically deficient people throughout the US's business-political system and the Republican Party is full of them - they are all enabling and supporting Trump, so far. How much longer will that last ? Question : Just how big a criminal does a U.S. President have to be to lose the support of his Republican Party ? 24. If Trump adds to his obstructions of justice or tries to refute the findings and evidence of Mueller's criminal investigation (Trump seems highly likely to continue doing this) then this would plunge the country into an even longer and deeper period of constitutional and political chaos. Its impossible to predict how the impetuous and irrational Trump will behave and therefore how his downfall will evolve. Only the Democrat-controlled House of Representatives appear disposed to restrain him, but their powers to actually stop Trump are limited. They can vote to Impeach Trump but they then have to pass it to the Republican-controlled Senate who would Try Trump and decide whether or not to convict him. No previous President in US history has been convicted in an Impeachment process. At present its impossible to know how much further the Republicans controlling the Senate will go to defend and protect him from the laws, from Justice, and from Impeachment. and it is now very deeply entrenched. So, we predict that these Republican Senators could fail to break with this pattern. They may fail to take forward an Impeachment process and convict Trump, simply because they are too much like Trump. They may fail to Impeach him because they are so steeped in the same neoliberal values, corrupt as those are, and fail to see his crimes as 'real crimes'. Trump's business universe has been set up by him and is run by him in the same way as thousands of other U.S. corporations. Trump's corrupt business universe is a small example of what is widely wrong inside the corporate sector of neoliberal disaster capitalism. So, for these Republican Senators to Impeach Trump is to admit that much else is also wrong - across the toxic political-business culture of the U.S.A., and in the whole pattern of corporate behaviour. For these Senators to Impeach and Convict Trump would be to also Convict the political-business values of themselves and their own Republican Party - their very core foundations. The longer these Republican Senators do not deal with Trump decisively, the longer this crisis will roll on and the more the chaos will extend and deepen. 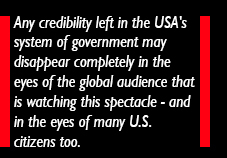 Any credibility left in the USA's system of government will disappear completely in the eyes of the global audience watching this spectacle - and in the eyes of many U.S. citizens too. will ramp up the pressure on the Republican Senators until they can no longer resist Impeaching and convicting Trump. Any delays in this process will do further harm to the U.S.A. It is interesting here to look at the precedent of Richard Nixon, the criminally corrupt and disgraced former (Republican) President of the USA who in 1973 sacked a Prosecutor who was investigating him for his leading role in the 'Watergate scandal'. Several months later in August 1974, after a constant stream of lies and denials, and before the Impeachment process could begin, Nixon resigned (there is more on this in paragraph 50 here). Regarding Nixon, we must not forget that as soon as the new 'replacement' President (Gerald Ford, Nixon's Deputy and also a Republican) came into office he pardoned Nixon ! Trump is not waiting for that, he has such a deluded sense of his own immunity that he has already claimed that he could pardon himself, and anyone else he wishes ! He cannot be sure about that because the extent of a President's powers to pardon someone (in this case himself !) of a Federal conviction have never been fully tested and defined, either in Congress or in Court. So, (ridiculous as it may seem) the US Congress or Courts may be pushed to decide this at some stage during Trump's downfall. Question : Do the U.S. laws and Constitution allow a President to be a full-scale pathological liar and Despot, or not ? Yes or No ? cites : "a pattern of persistent illegal conduct...occurring over more than a decade, that includes extensive unlawful political coordination with the Trump presidential campaign, repeated and wilful self-dealing transactions to benefit Mr Trump's personal and business interests, and violations of basic legal obligations for non-profit foundations". Infamously, Trump used this 'charity's' money to indulge his 'appreciation of the arts' (sic) to buy a six-foot portrait of himself costing $60,000 ! What the Court will make of this (and all the other charges) we look forward to finding out. Since Trump took office as President, the New York Attorney General has so far brought over 100 legal or administrative actions against Trump and against congressional Republicans. These will not be the last, and New York's actions are not the only legal actions in the Tsunami heading towards Trump, his family and his cronies. TRUMP - HOW WILL ALL THIS END ? 28. For those of us around the world and in America who have been shaking our heads, the 'Trump era' may have been happening painfully slowly, but there is a real prospect that his downfall is getting closer. Maybe, after revelations of criminal acts and misdemeanours emerge from the Investigation he will eventually succumb to accumulating pressures, and 'jump' before he is thrown out of office - just like Nixon ? If he does, will he be pardoned, or will he become open to Federal indictments. President or not, many rumours of Trump's comprehensive criminality have been swirling around for decades. Based on our vivid memories of the Nixon end-game, it seems we are now moving inexorably into Trump's end times. Trump's end times are very different - more complex and multi-faceted than Nixon's end times. For one thing, Nixon's crimes were small compared to Trump's. Yes, even the comprehensively corrupt Nixon was small fry compared with Trump. 'Exit' signs, whatever fantasy he tries to portray. However, given Trump's extreme personality, his pathological lying and his many enablers and collaborators in the Republican Party (and in the Supreme Court) this will be a severe test for the American political and legal system and its Institutions. This is a test the USA could fail. It has become an alarming and epic spectacle for the world to witness, with risks at every stage that the USA may not deal with this Bad Leader and his cronies decisively. It is imperative (in any sensible universe) that Trump and his cronies are made accountable and brought to Justice. 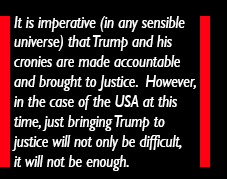 However, in the case of the USA at this time, just bringing Trump to justice will not only be difficult, it will not be enough. Even if Trump were to be Impeached, convicted and jailed (unlikely as that is), how much of the USA's money-driven and toxic political-business culture and system will remain in place - to continue degrading US and global politics into the future ? The US Constitution, laws and governance system need to be improved for the benefit of the citizens of the USA and the world. Note : We are not trying to provide an up-to-date news service on Trump's evolving fall from power. But we will add here a digest of the main developments as they occur, and keep our focus on the main issue : Bad leaders and bad governance in the world's most economically and militarily powerful country on earth.